Oxford University has won a new High Court ruling over protests at its new biomedical research laboratory. 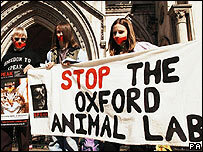 A judge found Animal Liberation Front press officer Robin Webb was a " pivotal figure" in the organisation and should be subject to an injunction. The injunction allows a weekly protest by named individuals and a number of groups but otherwise bans activities within a designated exclusion zone. Mr Webb had contended he was not an ALF member or part of its support. He argued that acting as an apologist for the ALF was lawful, provided the role did not cross the line into incitement. Mr Justice Irwin, however, ruled he was not a journalist but a propagandist who "echoed the threat from the ALF to the university". He said Mr Webb's activity "goes far beyond legitimate self expression". The injunction seeks to protect staff, students and contractors at the £20m site from intimidation and harassment. Mr Justice Irwin accepted it was unlikely that Mr Webb, who had held his post since 1991, had been involved "in any practical hands-on ALF criminal activity, at least for many years". But he said: "Without the encouragement of publicity it is likely that fewer would join the movement and many within it would fall away." He said Mr Webb "strives day after day to maximise and potentiate the effect of criminal acts on the minds of those whom he wishes to frighten." A University spokesman said: "Evidence provided to the court demonstrated that Robin Webb played a key role in disseminating threats against Oxford and all those associated with it. "We are pleased that the court has recognised this was a vital part of the strategy to create a climate of fear."